The morning started early and what a pleasant view from the breakfast room window....Sun and few clouds. 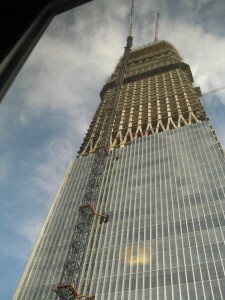 We looked out our room window and saw the construction going on of the tallest building in Beijing across the street and nearby the two cantilevered buildings that look like they are going to fall on each other. We took of with my cousin's wife's sister-in-law to catch the subway to Tian'an Men Square. The trains were packed with commuters like sardines! We made it anyway. The police at the square are very efficient and keep pedestrian and vehicle traffic going. Walk on the right side, don't walk up the wrong stairs. When we got to the square it didn't seem to me as big as I thought it was going to be. Maybe because there were still a lot of displays set up on the sides and middle for the past week's National Day celebrations and the impending meeting of the Congress next week. We spent time taking pictures and listening to the history of the square. We then walked to the south gate of the Forbidden City and walked on the platform that Mau used to stand on and wave to the masses standing in the square. We then proceeded to spend 2 hours walking through the Forbidden City. We rented English automated guides that pick up a signal and tell you about what you are walking by or into. We saw rooms with weapons, musical instruments, clothing, uniforms, jewelry, a three story theater, thrones and throne rooms, living areas.....A couple of the larger halls were undergoing renovation so we couldn't enter them. The palace was built in 1420 and housed 24 emperors over a period of 500 years. We then were picked up by my cousin's wife's brother and drove through a nearby hutong. Hutongs are small communities grouped together throughout inner Beijing. These homes are centered around courtyards where the families live and often work in stores that front the very narrow streets that run through them. We found a bar that they frequent near the art school that she attends. This was the first Western style food we have had since we arrived here 10 days ago. I had lasagna and Carol had grilled chicken salad. (Oh, for the past two days Carol has been suffering from a head cold and cough and has been feeling pretty miserable). We then took off to view the Forbidden City from a hill to the north in Jing Shan Park. This was a brisk healthy climb, but the view was fantastic from the Buddhist temple. The hill was created from the earth that was excavated from when the Forbidden City was built. We then took off for the northwest corner of the city to view the Summer Palace. This palace was developed in the late 1700's as an imperial retreat. Some of the notable features are the Stone Boat made of marble, the Tower of Fragrance (which we didn't climb) and the Long Corridor which is 728 meters long and is painted with over 14,000 scenic paintings. After we viewed the Stone Boat, we took a boat (wooden) across Kunming Lake to the 17 Arch Bridge and then drove back to the hotel, driving by the new Birds Nest Olympic Stadium, where we collapsed and slept until dinner. We all went to a nearby restaurant where we again had many good plates of food, topped by Peking Duck carved at the table. This was followed by a delicious sweetened and heated Red Bean Paste. Set on the site of the former Imperial Way, the broad square is also a recent creation, dating from the 1950s when Mao, encouraged by his Soviet advisors, ordered the clearing away of the old government ministries. There were plans to "press down" the "feudal" Forbidden City by surrounding it with high-rise buildings and smokestacks, but the fledgling republic lacked the resources to carry out the plan. Summer Palace (Yi He Yuan) Later in her rule, Cixi spent a considerable amount of time in this watery imperial playground, even setting up her own photographic studio. Modeled on Hangzhou's West Lake, the complex was ransacked by foreign troops in 1860 and 1900, and restored under Cixi's orders, on the first occasion with funds earmarked for the navy. The lake is the gem of the palace: Escape the crowds for an hour or so by hiring a boat, or in winter, a pair of skates. On land, allow 3 hours for a cursory look around.